Sipping sundowners at the Oyster Box hotel and enjoying a sunset from the magnificent verandah is my favorite indulgent pastime on lazy summer days. If i did not know any better i would think that the majestic lighthouse prominently displayed in front of the hotel, was built and painted to fall into the striking red colour scheme of the Oyster Box hotel but locals will tell you Umhlanga’s beach has been dominated by the distinctive Red, twenty one meter high lighthouse since 1954. 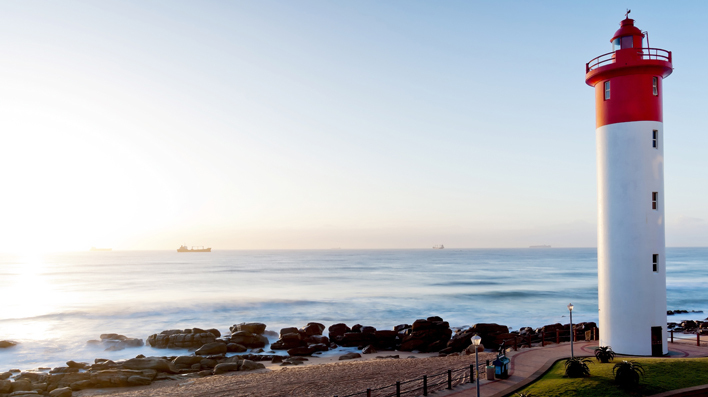 The newly upgraded Umhlanga promenade allows visitors to see the Lighthouse up close and personal. The Umhlanga lighthouse’s beam emits a light equivalent to six hundred thousand candles flashing every twenty seconds, and can be seen from as far as twenty four miles away at sea during visible conditions. The intrinsic relationship between the Oyster Box Hotel and the Lighthouse goes back many years since the hotel serves as the official Lighthouse Keeper, controlling the lighthouse in the hotel office where staff monitor the controls, and report to Portnets Lighthouse Service. Pity! I was about to apply for the job…… Instead i will encourage all guests of The Beach House, Umhlanga to vsit the Oyster Box hotel and the Lighthouse at least once during their stay with us.